A Colour Enhancing Daily Diet for Red Parrot. A revolutionary diet developed exclusively for use with Red Parrot where active color enhancement is desired. 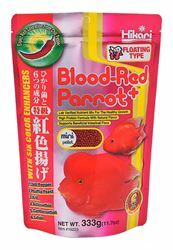 Blood-Red Parrot+™ is a revolutionary diet developed exclusively for use with Red Parrot where active color enhancement is desired. The inclusion of the Hikari-Germ™ promotes extremely efficient nutrient utilization while the balanced ingredient profile supports immune system health, desirable form, predicable growth, sufficient energy sources and improved coloration. Great for advanced hobbyists who want their Red Parrot to develop their full potential. 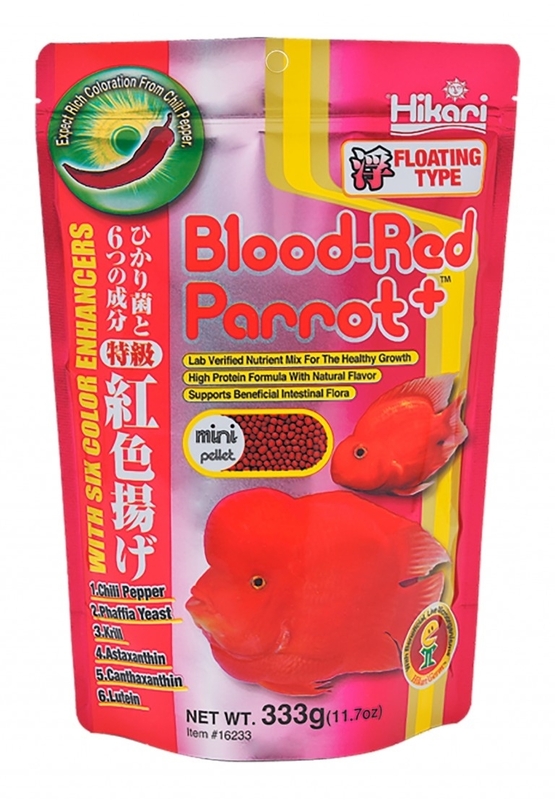 The superior color enhancing effect derived from our scientifically developed, Hikari® Aquatic lab verified formula which includes chili Pepper, Phaffia Yeast, Krill, Astaxanthin, Canthaxanthin and Marigold Flower Meal (as a source of Lutein) helps your Red Parrot retain their true natural beauty year round.